The MBTA offers students a discount of 11% on T Passes for four months' worth of passes for the Spring 2016 semester - February, March, April, and May - through the MBTA Semester T Pass Program. To enroll in the program and receive the discount, you need to pay for all four months upfront. Discount pricing for the 4 months of passes can be found on the form above. Payment is due with the order form (please click image above and print). Credit card, personal check and money orders are accepted payments for this program. We cannot accept cash payments. Orders must be in our office's hands by the in-hand deadline - not postmarked by that date. You can mail the form to the address listed on the form, or put it in Jeff Morris's mailbox on the 2nd Floor of 320 Newbury St in the Education Center. Please do not put checks, money orders, or credit card information under his door. For info about what is included in each pass, see the image below. The passes are paid for as a four month group of passes, which are picked up monthly at the Office of Student Life (320 Newbury, rm. 102). Link Passes are issued on a Charlie Card once per semester, and re-loaded each month. If lost or stolen, Charlie Card Link Passes can be replaced by contacting the Office of Student Life. Unfortunately, at this time, all other types of passes cannot be refunded due to the technology used by the MBTA's commuter rail and boat system. 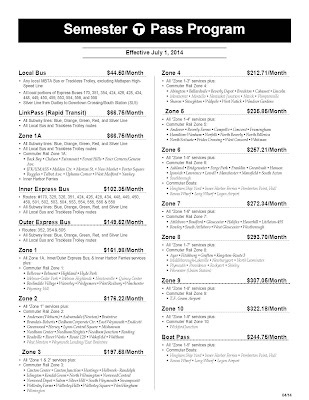 The MBTA does not offer the option of purchasing a one-month pass through the discount program. Since the BAC pays for the passes upfront with your payment - the MBTA will not issue a cancellation, refund, or change of zone/type of pass. 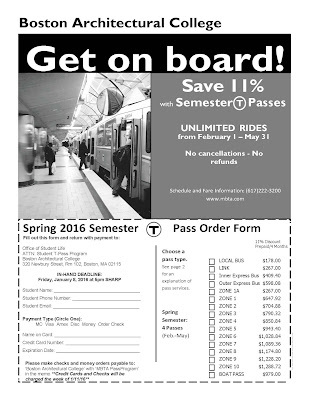 The BAC offers the MBTA T Pass Program to our students as a courtesy, and the College does not profit from the sale of these passes. Why is the deadline so early? A payment deadline is set by the MBTA for the BAC. In order to process all of the payments in time for their deadline, this is the necessary deadline. What pass will I need? For routes and schedule information, please consult the MBTA website or call them at 617.222.3200. The Trip Planner tool on the MBTA website is very useful. What is the difference between the Zone 1A pass and the Link Pass? Doesn't the Zone 1A give you more? Link Passes are issued on a Charlie Card picked up once per semester, and automatically reload each month. Zone 1A passes are the paper passes that are issued each month, and need to be picked up each month. If lost, Link passes can be replaced. Zone 1A passes cannot. The Link pass does not include travel on the Commuter Rail or Inner Harbor Ferry. The Zone 1A Pass does provide more (see pass information sheet above for exact pass info), but students should weigh out the differences and select the pass that is best suited to their needs before ordering. What if I need a different type of pass after my order has been processed? 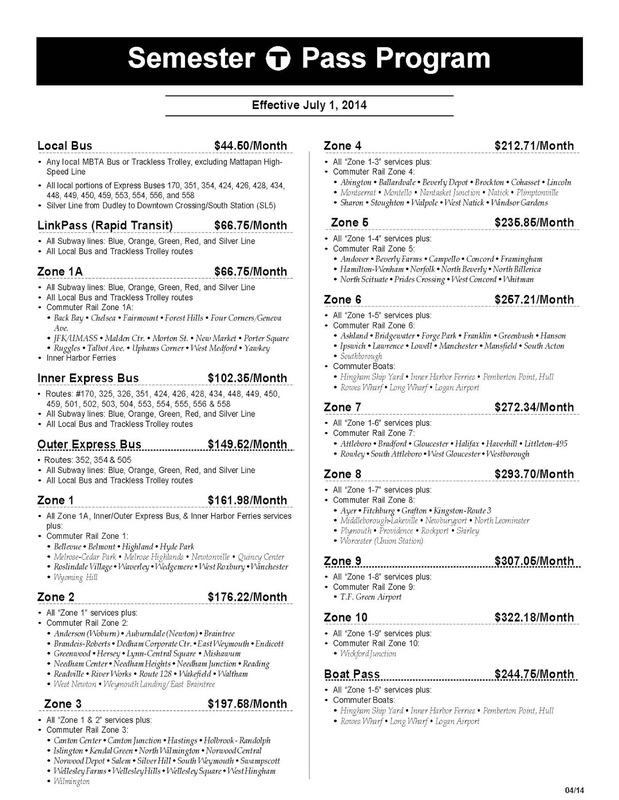 The MBTA Semester T Pass Program does not offer any refunds, exchanges, or cancellations. Can I sign up for this program if I am not currently a BAC student? What if I am a faculty or staff member? This program is only offered to currently enrolled BAC students. All students' names are verified prior to the submission of our order. Faculty and staff are not eligible for this discount, but can contact Human Resources to sign up for employee pre-tax paycheck deduction plans. I know it is past the deadline, but why can't I sign up? The MBTA has a strict deadline they need in order to get the College's passes ready, and in order to get our order placed by their deadline, we must too.